I was born and raised in Houston. I have always wanted to be a police officer. While growing up I always played cops and robbers with my ten brothers and four sisters. As a single parent I was not able to attend college right after high school. Once my daughter got a little older I was determined to become a Houston Police officer. 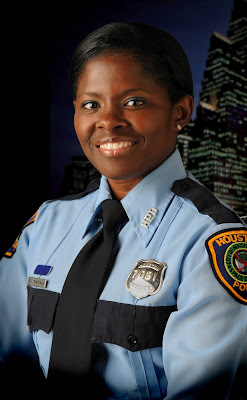 I obtained my Associate's Degree in Law Enforcement at Houston Community College, while working as a civilian in the Dispatch and Records Division. 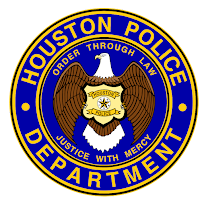 I graduated from the Houston Police Academy (class #176) on March 03, 2000. I successfully completed the Field Training Program and worked as a patrol officer at Northeast Patrol station and later, Southeast Patrol station. Along with my patrol duties, I was a Field Training Instructor and got to instill my passion and experience on young officers as they started their career. I have since obtained my Bachelor's of Science degree in Criminal Justice and my Master of Arts degree in Criminology, while taking advantage of the department’s educational reimbursement program. The department’s reimbursement program was extremely important to me. Coming from a very large family, my parents could not afford to send me to college. The police department helped me achieve my goal and allowed me to further my education. I’m excited to be part of the Recruiting Unit and even prouder to be a police officer with the Houston Police Department. I plan on giving my best to the unit while obtaining quality applicants who, like me, are proud to become Houston police officers. It is an exciting, challenging and fulfilling career. 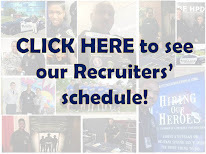 I am Officer Miller and I am a Recruiter. I know her! She was the officer that interviewed me. She was very nice and professional. Once I become a police officer, I am going to send her a thank you card! Great Job Officer Miller! Cool Officer. She trained me! Proud of you Officer Miller. Nice job. She is great! Ofc. Miller thank you for your exceptional professionalism, personal initiative, and your dedication in making my hiring process as "smooth" as possible. I look forward in being part of HPD and maybe one day work along with you. Wow! Her story is inspirational. I'm hoping to do the same as she is doing. My dad can't afford to send me to college, but at least I have done two years of college.